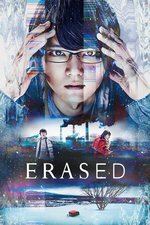 The popular manga Boku dake ga Inai Machi ("The Town Without Me"), previously made as both an anime series and a live-action film, comes to Netflix as the live-action tv series Erased. After finding his mom killed, Satoru's time-traveling ability takes him back 18 years for a chance to prevent her death and those of three classmates. The series is a co-production with Kansai TV and is in Japanese with various dubbing and subtitle options. I am not an anime person or a manga person, usually. No disrespect, there's just only so much time in the day and I've never gone down those roads. But I am most assuredly a time travel/history changing/multiple timelines conundrum person and this show delivers on that. I'm about halfway through the season and am enjoying it. It's melodramatic, but I like it.